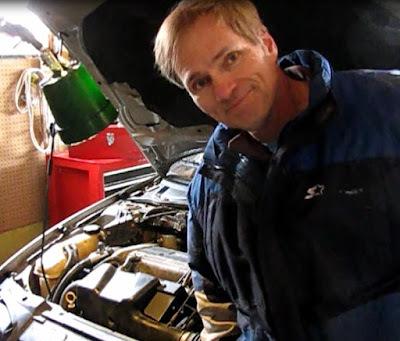 One morning this past winter, a friend's 2003 Chevrolet Cavalier cranked but failed to start. The starter seemed to be running free, as if under no load. 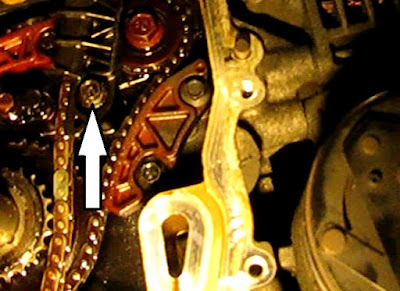 Removal of the valve cover revealed a very loose timing chain. 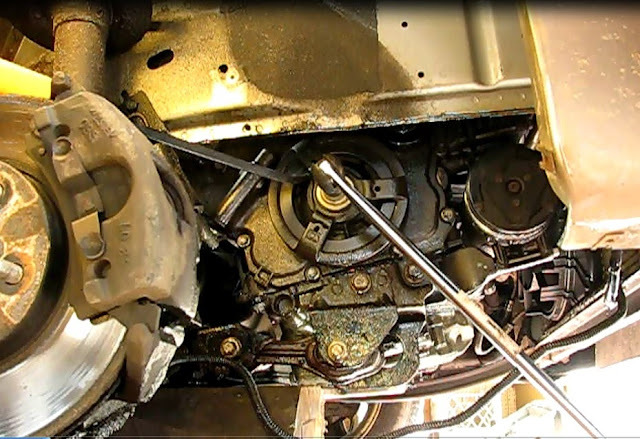 This post will cover removal of the valve cover and a front engine tear down. 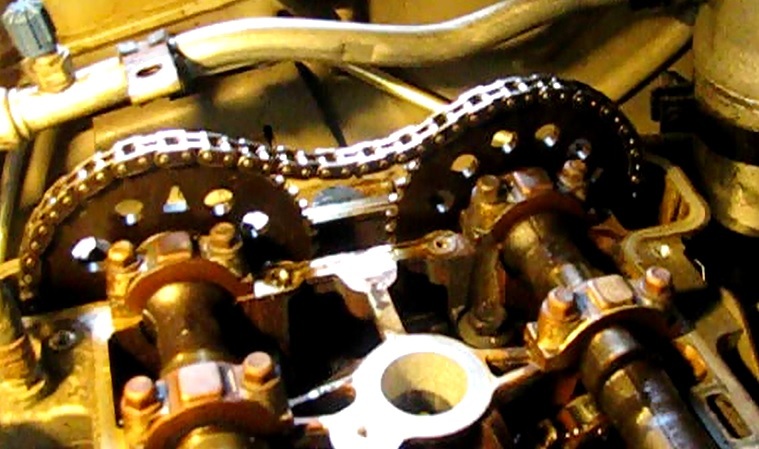 Then the chain and associated components will be removed and inspected. Correct cam, piston and crank timing will be re-established. A new kit of timing parts will be installed. Then we will re-assemble and test the work. There is always the possibility, on an interference engine like this, that valve damage may have occurred. A leak down test is ideal here, but we did not have the equipment. We also felt confident that the chain coming loose on start-up made valve damage unlikely, as opposed to under load. This is a challenging repair (we got a $1200 estimate) but we completed it successfully and I wish you good results if you tackle this job. Parts: Timing chain kit (Cloyes 9-4201S), timing cover gasket (Fel-Pro TCS46041), crank pulley bolt, valve cover gasket set (Fel-Pro VS50596R), if needed. 1) Disconnect the battery. Safety first. 2) Remove two 10mm nuts mounted on studs in the driver's side of the valve cover. These secure the metal fuel lines. 3) Loosen but don't remove the studs. There are two 13mm nuts welded onto these studs. Now there will be room to move the throttle cable bracket to allow clearance for the coil pack to be removed. 4) Unplug the wiring connector to the coil pack assembly. 5) Remove the four 10mm coil pack mounting bolts. 6) Wiggle and lift out the coil pack. The throttle cable bracket should be loose enough to get past now. 7) Remove the throttle cables from the bracket. The bracket will come along with the valve cover. 8) It will be helpful to remove two 10mm nutted studs securing the fuel rails at the radiator side of the engine. This provides more wiggle room to disengage the fuel lines from the brackets. 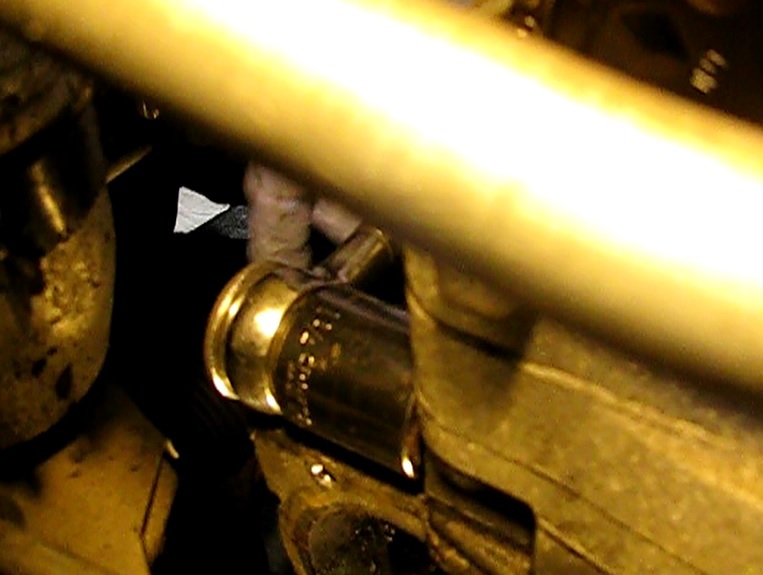 9) Unclamp and remove the rubber hose going to the air intake above the throttle body. Be careful here as I broke it off of the air intake box. I would recommend removing the air intake. 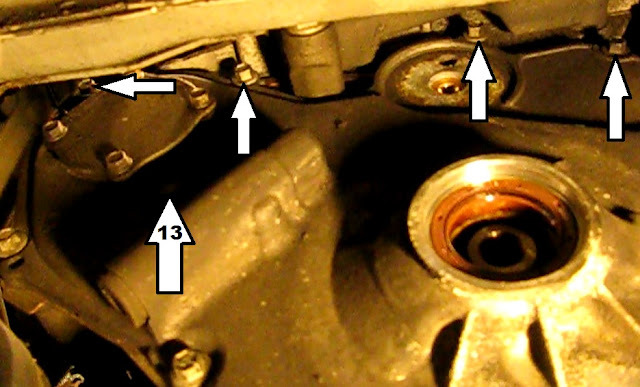 10) Loosen and then remove all 14 of the 10 mm bolts holding the valve cover. There are four in the middle now visible with the coil pack removed. 11) Tap on the cover with a rubber mallet. Use a small prybar at reinforced points on the cover to gently...and I mean gently, work the cover loose. Gentle repetition pays off. Listen for that little "pop." 12) Pull the cover up and now remove the 13mm stud on the firewall side. There is a ground lug behind it that must come off. The front (radiator side) stud can stay on with the throttle bracket. The 13mm stud (on the left) must be removed, the other only loosened. 13) Lift and pull the valve cover off the engine, moving it toward the passenger side. Now the chain can be inspected. This one was extremely loose. That's way too loose to work (guide removed for clarity). 2) Break the lug nuts on the right front wheel and jack it up, remove the wheel and set it down on a block of wood or a stand. 3) Remove the wheel well splash guard. This is complicated piece held in by 6-8 8mm hex head screws, and two panel fasteners. There are also several wires attached to the piece that need to be removed from holders. Keep track of all fasteners and the positions of wires to ensure efficient and complete re-assembly. 4) Remove the serpentine belt by inserting a 3/8" ratchet directly into the square hole (from below) and and rotating upward. Hold it there while slipping the belt off. 5) Remove the harmonic balancer (crank pulley) bolt. 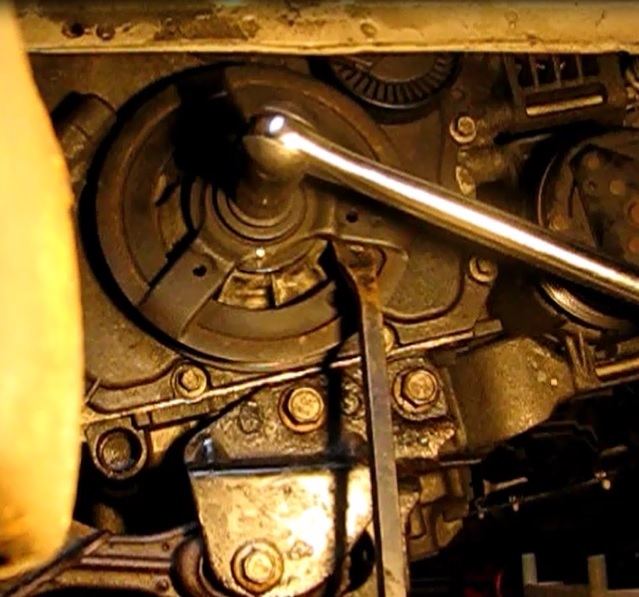 Jam a pry bar between one of the three cross arms of the balancer and the top of the steering knuckle and lock it in place. Place a 21mm socket on the bolt and use the biggest breaker bar you can get to break the bolt. I used a 24" bar. There is plenty of turning radius to break this highly torqued bolt. It turns off in the conventional counter-clockwise direction. 6) Pull out the crank pulley. It slipped right off for me with no tool use whatsoever. 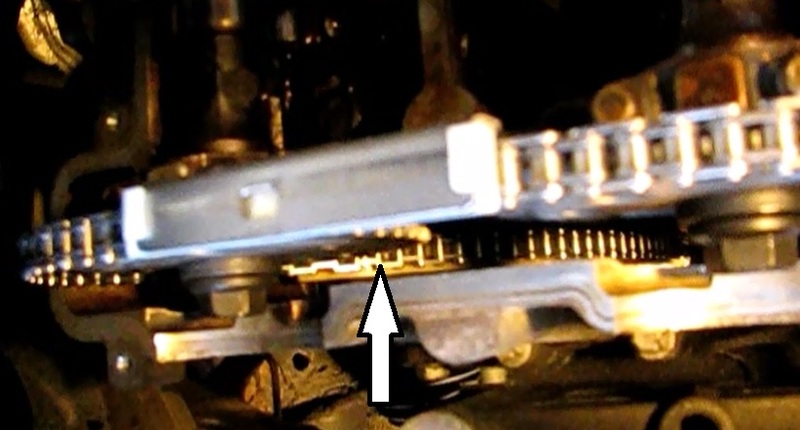 7) Remove the serpentine belt tensioner. This 15mm bolt is not heavily torqued. 8) Loosen all ten of the 10mm timing cover bolts as well as the longer and bigger 13mm bolt. Once all are loosened, remove them all. Several are a bit hard to reach and will require a longer 10mm wrench or a standard 10mm wrench. The upper 4 bolts here indicated are the tougher ones to get out. 9) Tap on the cover with a rubber mallet. It will be necessary to pry (gently and repetitively) with a small pry bar at several reinforced points and corners to work it loose. Take your time and don't damage the cover or score the mating surface of this aluminum piece. 10) As the cover comes off there will likely be more oil dripping out. On this Cavalier, a piece of the gasket runs on the other side of the front engine mount, making it necessary to cut the piece to get the gasket over the mount. Finish removing the gasket and timing cover. I discovered to my dismay that the front engine mount is almost directly in front of the plug for access to the upper fixed chain guide mounting bolt. The only way to get this plug and guide out, that I could find, was to remove the wheel well part of the mount and back off the part of the mount that bolts to the front of the engine. The only other way would be to pull the engine. I did not want to pull the engine. 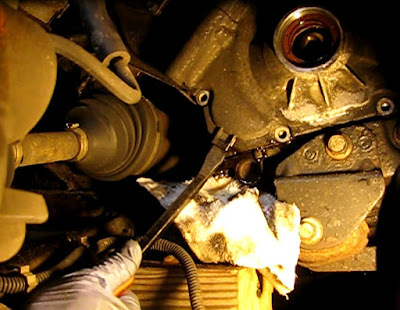 1) Put a jack with a large flat piece of wood under the oil pan to support the engine when the mount comes out. 2) Unbolt the cruise control unit from the strut tower (13mm) and a stud on top of the wheel well part of the engine mount (15mm). Set it up and out of the way on the wiper cowling. 3) Remove another nut on the same mount (15mm, use a deep well). This frees a bracket that holds a metal AC line. 4) Unbolt and remove the wheel well portion of the engine mount bracket. There are four 15mm fasteners that must come out, two nuts on the upper wheel well and two bolts fastening it to the other part of the mounting bracket. It's a tight fit but it will come out with some judicious wiggling and jostling. 5) Let's get at the other part of the bracket. Unfortunately it will not come out all the way, as the bolts top out against the inner wall of the wheel well. Using an 18mm wrench, box or open, turn them until they top out on the well. Now slide the bracket away from the engine as far as it will go. 6) Remove the access plug to the upper fixed guide mounting bolt. This has a 10mm Allen head. I took it out with a modified (shortened) Allen wrench and a two foot piece of pipe for a cheater bar. 7) If desired, now remove that fixed guide 10mm bolt. I chose to do it now, having some doubt as to whether I could get it out at all. 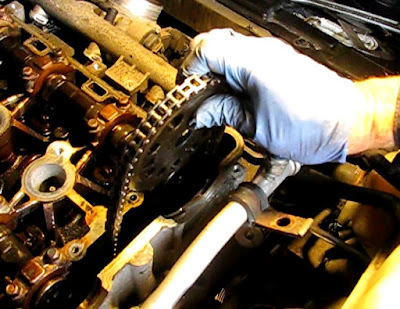 The official timing chain component removal guide calls for it to be done later. I used a 10mm socket, universal adapter, three inch extension bar and ratchet, all 1/4" drive. 1) Remove the tensioner (located on the firewall side near the front of the engine) with an 1 1/4" socket and ratchet or breaker bar. 2) Remove the upper timing guide bolts (2) with a 10mm socket and 6 inch extension, 3/8" drive. 3) Remove the exhaust cam sprocket. Use a 24mm back-up wrench on the squared part of the camshaft and an 18mm socket on the cam bolt. Discard this bolt. It is not reuse-able. 4) Remove the 10mm bolt for the adjustable guide. This guide is on the firewall side of the chain path. Now slide the adjustable guide upward and out through the engine chest. 6) Remove the lower fixed guide (radiator side) 10mm mounting bolt. 7) Remove the upper fixed guide mounting bolt 10mm, if not removed earlier. 8) Remove the guide downward and out. 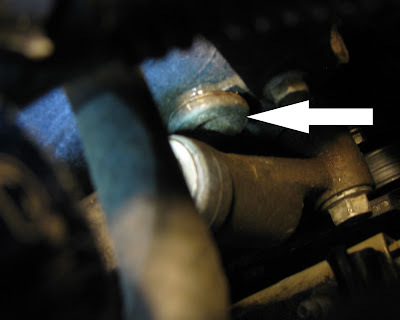 9) Unbolt the intake cam gear in the same manner as the exhaust was removed. 10) Remove the intake gear and chain together through the top of the engine chest. The chain will need to be guided through a protruding engine boss in the chest. 11) Remove the crankshaft sprocket. I inspected the tensioner and found it to stick occasionally. There were longitudinal score marks on the piston. The old chain, when set against a new one, was 3/8" or more longer. These two issues were enough to establish cause of the chain jumping time. I will replace all timing components. If your chain jumped, the timing on the cams will have to be re-established. 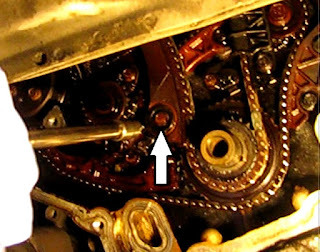 The safest way to do this on an engine like this, where the valves can contact the pistons, is to turn the crank ninety degrees before rotating the cam shafts. This will ensure that the pistons are in a midway position. 1) Turn the crankshaft ninety degrees in a clockwise direction and leave it there during this procedure. 2) Slip the cam sprockets back on. Determine how far off they are from correct locations. 3) Rotate the intake cam into position. The intake triangular timing mark should be at 2 o'clock (or sixty degrees). Rotate it in a clockwise direction with a 24mm wrench until it reaches that location. This will be a rest spot, where it has just come off the spring tension of valve activation. 4) Rotate the exhaust cam into timing position. The exhaust sprocket triangular timing mark should be at 10 o'clock (300 degrees). Rotate it with a 24mm wrench until it reaches that location. This is tension free spot where it will have come off of the spring tension of valve activation. 5) Rotate the crankshaft back to the 12 o'clock timing position. I decided to use a highly reputable Cloyes kit for this job. The kit includes the chain, the three sprockets, three guides, the latest tensioner, new updated oiler and new cam sprocket bolts. I will feature fewer pictures for installation,except where I see some insight or value, since they would be redundant. 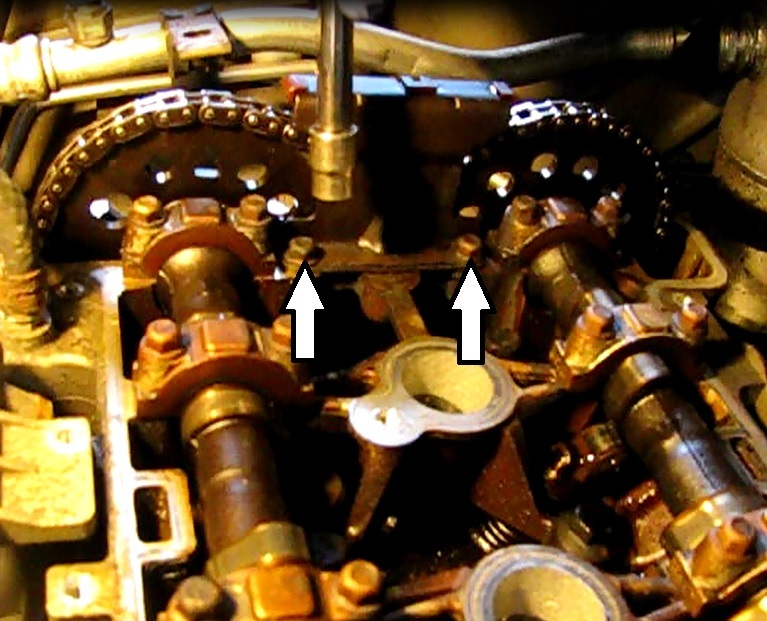 1) Place the crankshaft sprocket onto the crankshaft. 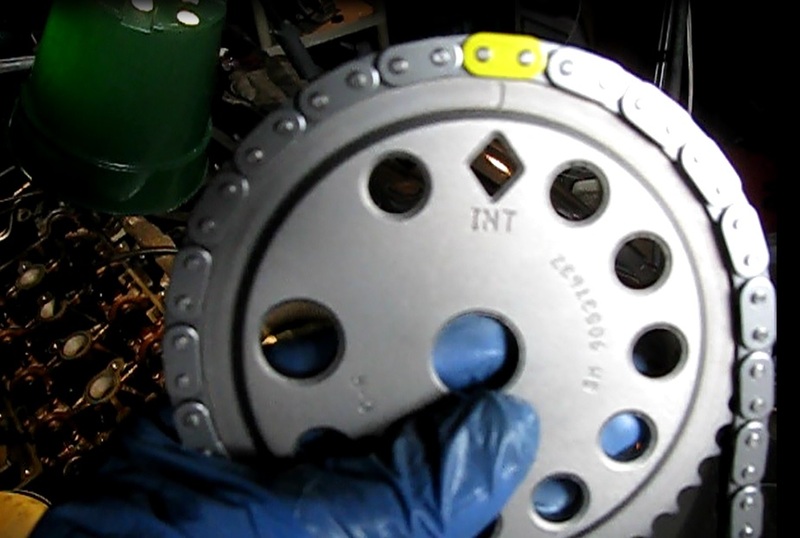 3) Place the chain over the intake cam sprocket, aligning the uniquely colored link (yellow) on the chain with the triangular cutout labelled "intake" on the sprocket. Turn in a new cam bolt, but hand tighten only for now. The unique link (yellow in this case) goes on the intake cam sprocket. 4) Thread the chain down through the engine chest, with one side of the chain on either side of the engine boss protruding inside the lower part of the chest. 5) Slip the adjustable guide down through the top. While aligning the similar colored link on the chain with the white timing mark on the crackshaft sprocket, place the chain between the sprocket and the adjustable guide and turn in the 10mm guide bolt. Torque to 29 inch pounds. 6) Install the exhaust cam sprocket. 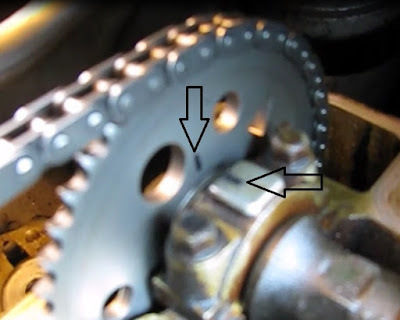 Match the other similarly colored chain link with the triangular "Exhaust" mark on the sprocket, then position it over the camshaft. Loosely turn in the new cam bolt only to hold the sprocket in the general location. Now turn the intake cam sprocket with a 24mm wrench while turning the exhaust sprocket until it seats on the end of the cam. This may take a few tries, This is a tight fit and I had some trouble until I removed the sprocket and chain and placed the sprocket by itself on the cam and made a mark on the engine and sprocket at the seating point. 7) Install the new fixed guide (radiator side) over the chain and torque the two bolts to 29 inch pounds. 8) Install the fixed guide access hole 10mm Allen plug and estimate torque to 55 ft lbs. 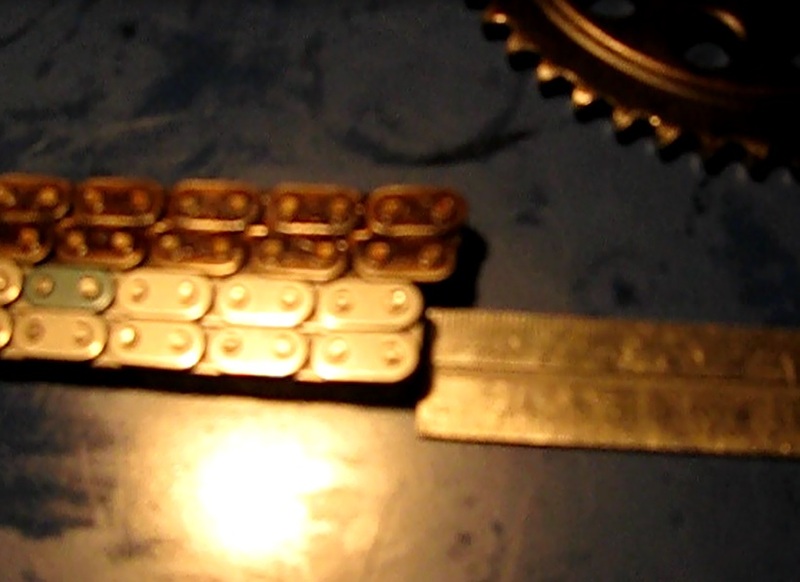 9) Confirm that all colored chain links and sprocket timing marks are correct. Intake at 2 o'clock; Exhaust at 10 o'clock and camshaft at 5 o'clock. 10) Install the upper timing chain guide and torque the two bolts to 29 inch lbs. 11) Apply final torque to the cam sprocket bolts: 63 ft lbs plus 30 degrees. 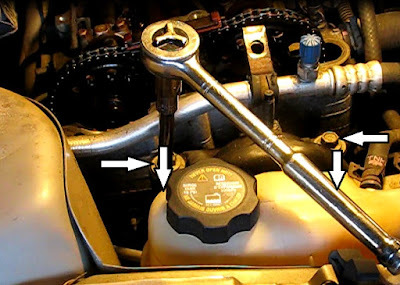 Use an 18mm socket with a 24mm back-up wrench on the camshaft. 12) Install the tensioner. Make sure it is disabled. Torque it to 66 ft lbs with a 1 1/4" socket. 13) Enable the tensioner by pushing on the chain with a non-metal rod. It will make a "click" when it is enabled. Mine enabled upon install, with no further effort needed. 14) Hand rotate the engine through two crankshaft revolutions (one cam revolution) and confirm all timing positions remain intact. 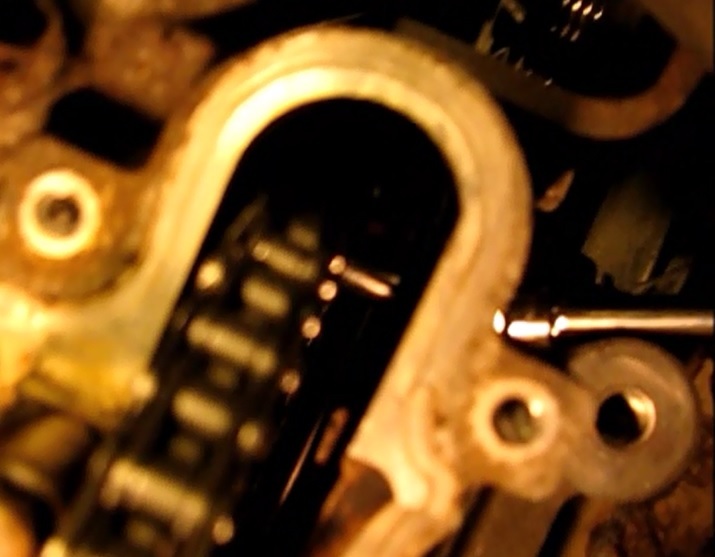 2) Place the new timing cover gasket in position on the hanging pins. For this Cavalier I had to cut out a small section of the gasket frame that fits on the upper side of the un-removable front engine mount. I used a Dremel cut-off wheel to cleanly remove a two inch section. This has no effect on sealing ability of the gasket. 3) Place the timing cover on the hanging pins. Hey, thanks GM, that was thoughtful. 4) Turn in the ten 10mm bolts until just finger tight, then gradually and carefully torque then back and forth and across until reaching 18 foot pounds. The larger 13mm bolt also is torqued to 18 foot pounds. 5) Remount the drive belt tensioner and torque to 37 foot pounds. 6) Install the harmonic balancer (crank pulley). Note that there are dogs in the pulley that need to fit to the oil pump. So turn those till then do and push it in all the way. 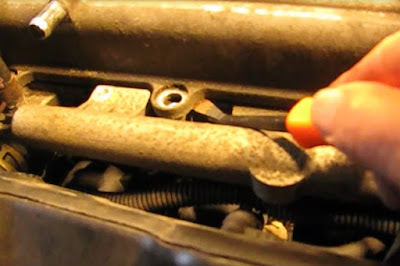 7) Install a new crank pulley bolt. I could only find one at a GM dealer. Torque this bolt to 74 ft lbs plus 75 degrees. I jammed a pry bar under one of the three cross arms of the balancer with the handle on the floor. This worked to hold it place while applying this torque to the bolt. I measured the 75 degrees and marked a corner of the bolt and point on the balancer with paint as a visual aid to achieve the 75 degrees. 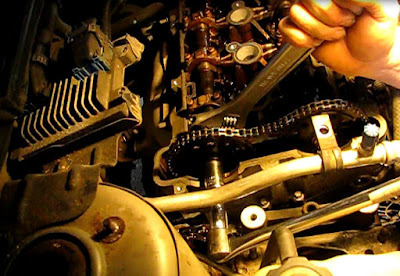 1) Install the drive belt. Wrap the belt loosely around the alternator, under the tensioner and around the crankshaft pulley. Use a 3/8" ratchet in the square hole on the tensioner to rotate it upward while fitting the belt around the ac compressor. 2) Install the wheel well cover. Position the cover roughly in place. Snap in the panel fastener by the horn first, route the wiring as before and snap the top part under the wheel well. Mount the 8mm hex head screws. Note: the short one fits on the inner wheel well. 3) Install the wheel and turn the lug nuts as far as you can, get if off the blocks and set it on the ground. 4) Torque the lug nuts alternately to 100 ft lbs. 1) Clean the mating surfaces of the top of the head and the valve cover. 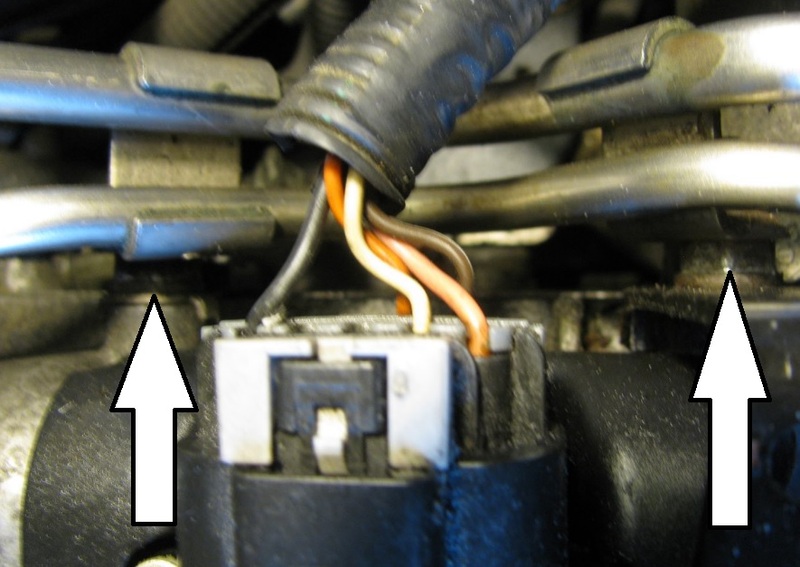 2) Install a new gasket if there is a need. The one on this car is in good shape. 3) Attach the auxillary parts to valve cover. Bring it in under the throttle cables but stop short of the end. It will have to be threaded into the two fuel rail brackets near the back end of the engine. First, though the firewall side stud will have to go through the lug of an engine ground before being threaded into the head. Turn it in all the way. Now thread the needle through both fuel rail brackets. 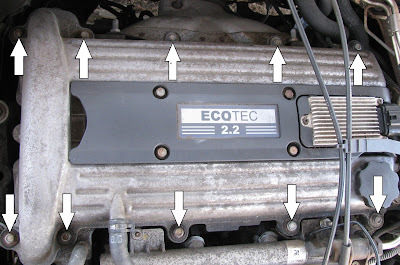 4) Put the valve cover down flush and bolt it in. Go from side to side with all ten outside bolt, in steps and then partially tighten the middle four. Torque them all the same way to 18 ft lbs. 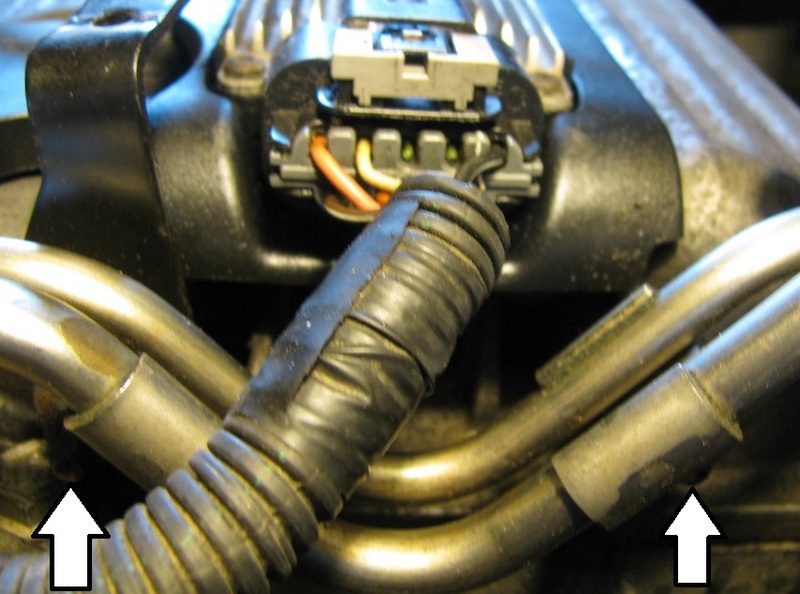 5) Return the throttle cables to their bracket. 6) Tighten the 13mm studs into the right side of the head. 7) Turn and tighten the 10mm nuts onto the studs, thereby securing the fuel line brackets. 8) Install the air intake assembly. Push the hose into the tube on the front of the head. Seat the assembly over the throttle body and attach the other end to the incoming air duct. Tighten all the clamps. 9) Fill the engine with oil. The smile says it all...it's runnin'. The Cavalier took 20 or more sets of engine cranks before it turned over and started to run. So don't be discouraged if doesn't just pop right off. Now this one had been sitting outside for several winter months before this repair was attempted. This is my first GM chain replacement, although I have successfully completed several timing belts. I found this tougher work. I logged nearly 20 hours on the job. If you are a beginner, plan on having the car down for several days and that's if you push it hard. Good luck and don't be afraid to try. If this post helped you, I would really appreciate any donation you would be able to make to this blog (see the sidebar Pay Pal link). This was a lot of work to make! Have a good one.